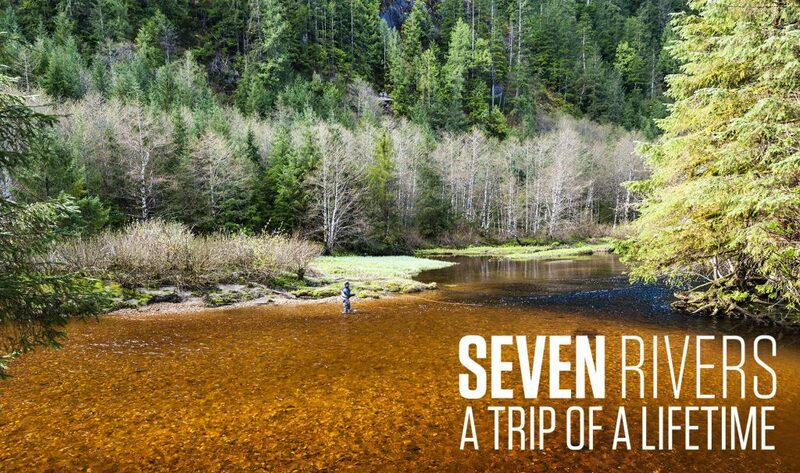 “Seven rivers” – Our Remote and Exclusive Coastal Steelhead Program for only two rods weekly – April / May: The ultimate trip for the profound and committed Steelheader who likes a bit of sweat with their Steelhead. During 6 days you will daily discover premium fly-fishing Steelhead water with numerous holding pools in the most stunning scenery with an abundance of wildlife ever present. If the idea of going on a wilderness adventure to target large, wild Steelhead in remote areas on lightly fished streams gets your blood racing, then our new remote coastal Steelhead package is what you’re looking for. The remote coastal wilderness Steelhead streams of British Columbia hold exceptional spring Steelhead opportunities located in the stunning fjords of the Great Bear Rainforest. There are numerous streams that vary from medium sized rivers best suited for swinging flies with a small Spey rod to small, intimate streams where you can sight fish for 5 to 20 pound Steelhead and fish for them with a light switch or single handed rod. With this new program we strongly believe that we have tailored THE ULTIMATE STEELHEAD TRIP for guests who are looking for the unspoilt nature and abundant wildlife that contributes to an unforgettable fishing experience. Jump on our new wagon that will lead you to some of the world’s most beautiful and pristine Steelhead rivers. Spring Fishing for Steelhead – A hidden gem in March and April: Skeena is justifiably world-renowned for its summer and fall steelhead fishing. But perhaps the most hidden gem in the region’s treasures is the spring fishery in the lower valley tributaries and the lower Skeena river. Here, as the alders bud and ruffed grouse drum in the forest, fresh steelhead push into pools to join the nearly year-long run and the fly fisher has an opportunity to connect with what are often the largest steelhead of the year. Many people believe that the Skeena watershed is easily accessible with easy-going fishing, but that is not true if you really want to get to the fish. Many of the best rivers and spots are more or less impossible to access without a guide and special license, and the only way to get there is by powerful jet boats and local knowledge. Some of the most attractive rivers are licensed with limited access for only a small number of people. Salmon Junkies has access to all classified water plus well-selected numbers of coastal rivers. Skeena has become quite a popular destination for trophy Steelhead and Chinook, even more so after we launched our short movies, but to fish it requires extremely talented guides who can maneuver and pick the right spots for any given time or situation. We dare to say that we have the best team of Steelhead and Chinook guides and they are willing to share their deepest secrets by leading you to the fish. The relatively low flows of late winter and early spring give the fly fisher access to classic runs, riffles and flat-water glides that are typically obscured by the higher, glacial flows of summer and fall. If you’re after the meanest, hottest, sea-lice covered Steelhead — you’ll want to be on the Lower Skeena and tributaries during this part of the season. 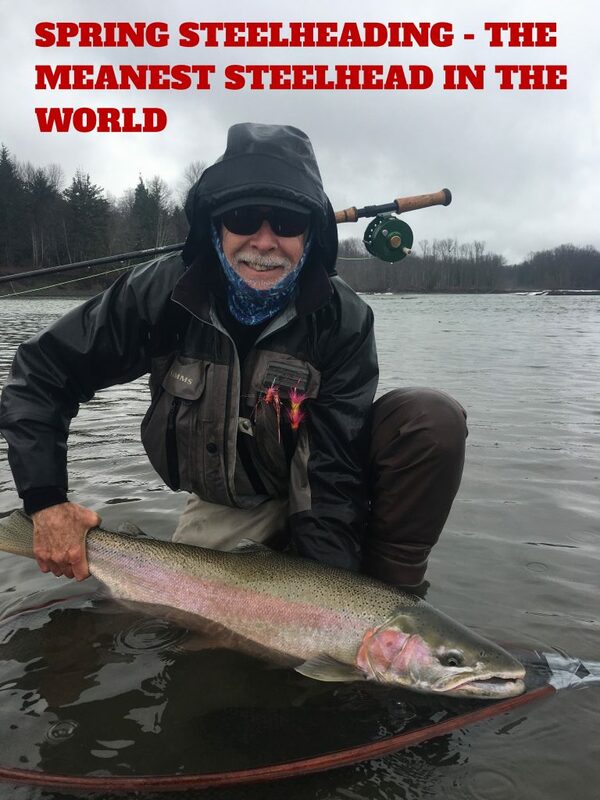 These awesome fish average 8 to 18 pounds, 20 pounds is not uncommon and a world record catch is not beyond imagination (Spring 2014 Salmon Junkies long termed friend Franco Sirtori landed a Fresh Steelhead estimated to 29 – 30Lb). It’s typical for even average fish to go on unstoppable runs, leaping all the way. These ultra-chrome rockets have left many an angler with shaking hands and wanting more.